I followed the Family on Bikes as they made their way from Alaska to Argentina a couple of years ago. I was hoping to meet them when they rode through Argentina while we lived there. But they took the direct route to the end of the world instead of riding east to Buenos Aires and then back west as they traveled to Ushuaia. Their plan saved them quite a number of miles, so I certainly don’t blame them. I was casually aware of their first big family bike trip through the US, but I didn’t realize it was a year-long adventure until I read Nancy’s book Twenty Miles per Cookie. They covered 9300 miles in 19 US states and 5 Mexican states. It sounds like it was a great adventure. The family left Boise, Idaho and worked their way to the Pacific coast. Like most bike adventure books I have read, the first part of the book was much more detailed on daily activities than the rest of the book. This is because the author is trying to set the stage for the types of challenges they faced on a regular basis. You are supposed to assume that many of these challenges followed them throughout the trip and therefore would become boring to read about on each page of the book. nd others I have read about is that this was the first time I read of a family adventure of this scale. If I didn’t know they were still together (because of their more recent cycling adventures) I would have thought they might end up living in four different houses after the first few weeks of their trip. Seemed they were getting on each other’s nerves at times. That is typical of a bike trip of this scale; however, when it is a group of guys riding together one can leave the group without it being devastating. Without a family court getting involved, this expedition had to stay together. The book chronicled some of their amazing days on the road. I know there had to be many more than what she included in book. What was fun for me was when she talked about places that I have been in my own travels (in a car, not on a bike). I can just imagine how spectacular some of those routes must have been. At times I felt like the family was too trusting when I saw how quickly they accepted offers from kind strangers. But I also know that being there in the moment gives you an insight into people and their characters that you can’t always convey in written form. As someone who has been hesitant to offer help to hikers and bikers because I didn’t know if they would want it, I am encouraged to be more willing to take the lead in extending a hand because of what I have read. As I mentioned, there are times when they were at each other’s throats. This involved Mom and Dad mostly. The kids were written about as if they were mostly angels on the trip. I may be revealing a little too much, but I often don’t like reading adventure books written by women. There is usually too much touchy-feely talk. This book had its share, but I don’t think it was too excessive. The one thing I would have liked to see in the book were some occasional dates. I don’t expect a daily journal format, but knowing about when certain things took place would have been nice. Based on the time of year and the location I could have gotten a better sense of what type of weather they were experiencing. With the exception of Halloween and Christmas there are few clues as to when they traversed different parts of the country other than the talk about it being cold and hot. I thought Nancy Sathre-Vogal did a great job in telling their story. While I may not like some of the way it was presented, I have to say that it was well written. I look forward to the announcement of a book talking about their Alaska to Argentina trip. 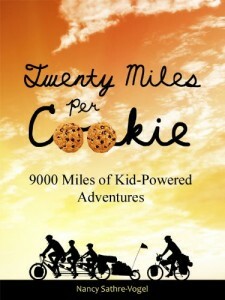 Twenty Miles per Cookie, Nancy Sathre-Vogel, Old Stone Publishing, 198 pages, 2011.